Despite widespread support in the Senate for the Trump administration's decision to denounce Nicolas Maduro and support Guaido, the sense-of-the-Senate resolution is unlikely to ever be introduced because Sens. Marco Rubio, R-Florida, and Bob Menendez, D-N.J., are in a stand-off over whether it should explicitly disapprove of any potential use of the U.S. military in the struggling country. Menendez, the top Democrat on the Foreign Relations Committee, has applauded Rubio's ability to influence the administration to take a strong position on Venezuela, but the two are in deep disagreement on how involved the United States should be. The dispute illustrates how partisan differences over both policy and process are likely to continue to divide Democrats and Republicans in the new Congress, despite growing bipartisan opposition to elements of Trump's foreign policy agenda such as his plans to withdraw troops from Syria and Afghanistan. Despite the rift over language, Trump's support for the opposition leader in Venezuela has been a rare area where both parties in Congress have largely agreed to date. Rubio, who adheres to an aggressive foreign policy ideology and is an outspoken opponent of leftist governments in Latin America, said that prohibiting the use of force is "problematic." He said the U.S. already has diplomats and "other" personnel on the ground already and that the option should be available to intervene. "The U.S. always reserves the right on use force and protect its own national security interest and the interest of its personal, so anything that would run counter to that would be problematic," he told NBC News. But Menendez, said that the Senate needs to be clear that its support on the policy means nothing more. "I think it's important for the Senate to express itself on democracy in Venezuela, supporting interim President Guaido and supporting humanitarian assistance. But I also think it should be very clear in fact that support stops short of any type of military intervention," Menendez told NBC News. While administration officials say that it has no plans to deploy U.S. service members to Venezuela, President Trump and top aides have repeatedly said all options are on the table, effectively putting Maduro on notice that he could face America's military might if he uses violence against protesters, Guaido or U.S. personnel in the country. The White House's National Security Council did not comment on the dispute or on what type of language the administration wanted to see from the Senate resolution. Although mostly symbolic, the resolution would send a message both to Maduro and to U.S. allies that Congress fully supports the president's move to recognize Guaido, proponents said. That could be useful as Trump's administration lobbies foreign nations to join the U.S. in recognizing Guaido as Venezuela's legitimate leader. The administration believes that the more countries that join the effort, the more unsustainable it will become for Maduro to remain in power. 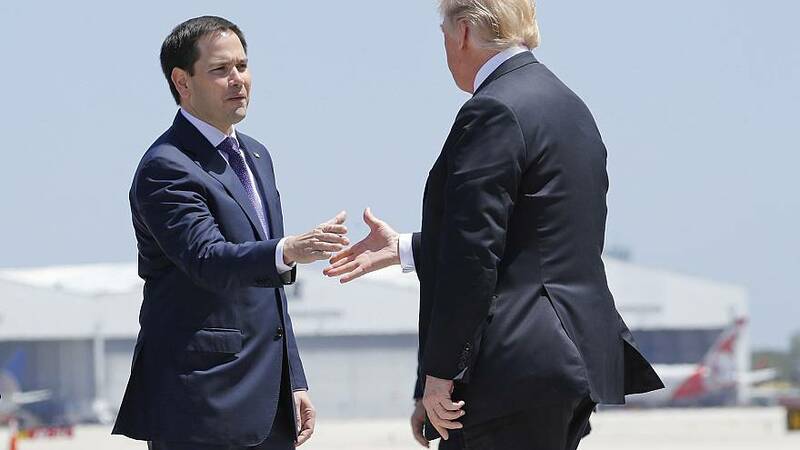 Rubio has been in close contact with the administration on Venezuela, even being the key architect, working alongside Bolton on the U.S.'s plan to back Guaido, according to individuals familiar with the administration's policy-making. But members on the left and the right, including Sens. Rand Paul, R-Ky., and Bernie Sanders, I-Vt., who are more uncomfortable with the heavy hand the U.S. has taken in Venezuela, would likely be against the measure if clear guardrails were not included. Risch was unwilling to overstep Rubio. He said the fight over military force "takes away from the substance of what that resolution is." "On the merits of what we've been writing legislation on, there is no dissention on the committee — zero — as to the substance of what we were going to opine on, that being that Juan Guaido is recognized by the United States of America, by our committee, as the lawful president of Venezuela," Risch told NBC News.